Your friends that use iOS and OS X have been babbling about Apple Music and Beats 1, but you use an Android phone and are feeling left out. Well, now there’s a “very unofficial” way to listen along. 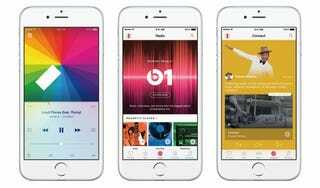 While the official Apple Music app won’t arrive on Android until the fall, Twitter user Benji R explains that he “managed to find an unencrypted HLS [HTTP Live Streaming] URL” of Beats 1. He’s posted the stream here, and it will work on devices running Android 4.1 and above (as well on devices using iOS 6 and above and Safari for OS X). While it’s not really a proper hack it seems unlikely that Apple will be impressed by the feat. Our bet is that it will get shut down pretty soon—so if you want to listen, best give it a try right now.